We at Aponia Painting Services understand the importance of your painting project – it represents an emotional as well as a financial investment! 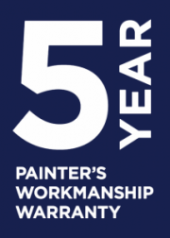 In order to protect your painting venture, we will offer you a 5 year workmanship warranty! With our warranty, your newly painted surfaces are covered for any blistering, bubbling or cracking that emerge due to faulty surface preparation as well as faulty paint application. Conditions do apply, so please do not hesitate to ask any questions if needed! There is more! Aponia Painting Services has an active $5 million public liability insurance policy, making sure that you are dealing with a legit business and adding an additional sense of security while we provide our services at your premises. Lastly, one more reason to choose our services is our Dulux Accredited membership. Being a Dulux Accredited painter entails high quality workmanship as well as a proven track record of impeccable customer service. And we can reassure you that is what you will receive from the team at Aponia Painting Services.